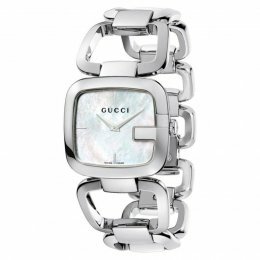 The Gucci G-Gucci YA125404 Ladies Watch is an iconic piece featuring the famed G on its bezel. This watch is stainless steel with a mother of pearl dial and silver-tone hands. The Gucci YA125404 Watch features a bangle bracelet band making it an elegant and sophisticated choice. 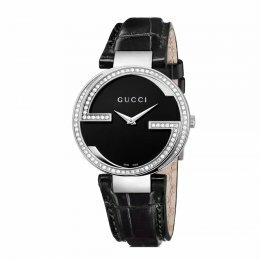 The Gucci YA133306 is a stunning ladies watch with a diamond-set interlocking double G bezel. It has a crocodile embossed leather strap with a steel buckle for closure. The Gucci Ladies YA133306 Watch is a Swiss made, luxury piece, part of the Interlocking Timepiece Collection. 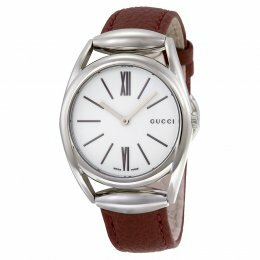 The Gucci YA140403 is a casual brick-red leather strapped ladies watch, part of the Horsebit collection. It features a white dial with Roman numeral hour markers and silver-toned hands. The Gucci YA140403 Watch is Swiss-made, also including water resistance up to 50 meters. 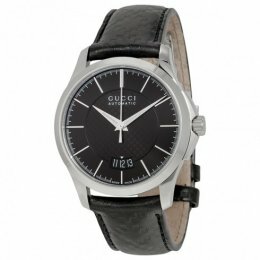 The Gucci G-Timeless YA126433 Watch is a handsome, classic style choice. It features a blue diamante pattern dial with silver tone hands and a black calfskin leather strap. This Swiss-made Gucci YA126433 Men's Watch shows date, hour, minute and second in a contemporary design. The Gucci G-Timeless YA126430 Watch features a stainless steel bezel and an iconic black diamante pattern leather strap and dial. The dial has silver tone hands, index hour markers and a rotating date window at 6 o'clock. Classic style and exceptional craftsmanship make the Swiss-made Gucci YA126430 a fine choice. The Gucci YA133314 is a unique interlocking-G ladies watch with a yellow sun-brushed grammium dial. This watch has a black stainless steel bracelet with a deployment clasp. The Gucci YA133314 is an exclusive watch part of the special edition Gucci-Grammy collection, featuring the Gucci Grammy Awards logo on it's case back. 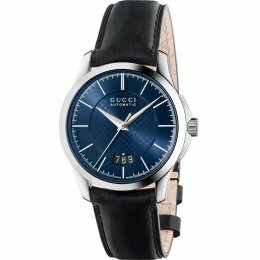 The Gucci YA139403 Watch combines the elegant Italian style of Gucci with Swiss watchmaking craftsmanship, giving you a beautiful and accurate timepiece. 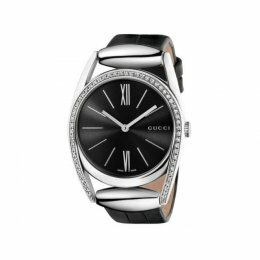 The Gucci Horsebit Ladies Watch YA139403 features a black dial with a stainless steel bezel set with 57 diamonds. 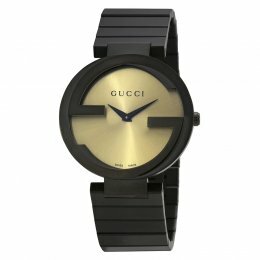 Showcasing the horsebit, one of Gucci's signature designs, and made with durable materials, the Gucci YA139403 Ladies Watch is the perfect choice. 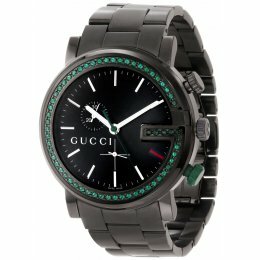 The Gucci G-Chrono YA101349 is a luxurious unisex watch with a G-shaped bezel accented with beautiful green diamonds. The watch features a black, stainless steel dial and bracelet making it sleek and stylish. The Gucci YA101349 Watch also features two subdials, 60 seconds and 30 minutes and is water resistant up to 30 meters, making it a perfect choice for practicality. 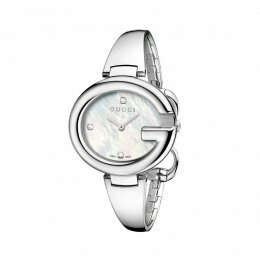 The Gucci YA134303 is a dressy, stainless steel Guccissima ladies watch with a mother-of-pearl dial, set with 3 diamonds for the 6, 9 and 12 o'clock markers. It features the iconic G on it's bezel and has a tapered bangle. The Gucci Guccissima YA134303 Watch's elliptical shape and fine color makes it an elegant choice for every occasion.